How to add value to your business through design — Spruce Rd. 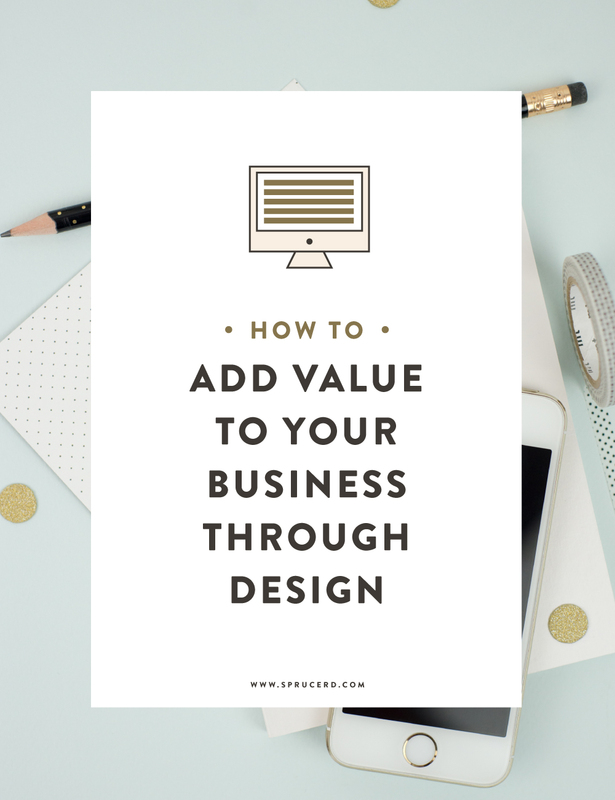 How to add value to your business through design | Spruce Rd. | There are countless times, whether in business or blogging, where a design need pops up. Whether it is through a blog post image, Facebook ad, infographic, sidebar button, or new promotion, graphic design has been my trusty sidekick through it all. Design skills aren’t reserved for only those who have a graphic design degree, but I truly believe that everyone is creative, and has the capability to learn the tools on their own. Here are a few ways you can add value to your business, through design. There are countless times, whether in business or blogging, where a design need pops up. Of course this holds true for me as a graphic designer, but I often take for granted the asset that my design skills bring. Whether it is through a blog post image, Facebook ad, infographic, sidebar button, or new promotion, graphic design has been my trusty sidekick through it all. Design skills aren’t reserved for only those who have a graphic design degree, but I truly believe that everyone is creative, and has the capability to learn the tools on their own. Here are a few ways you can add value to your business, through design. One of the most visually significant ways to add value to your business through design is to create quality branded blog posts. If your marketing strategy includes blogging, I highly recommend you invest the time to create a branded blog post graphic template. Not only will this save you loads of time when publishing to your blog, it will also present a cohesive + consistent brand to your readers. Your blog post images will most likely bring in the most traffic to your site. This is the powerful nature of Pinterest (we’ll get to that in just a bit! ), so you want to take advantage of it! One concern I hear regularly, is that people don’t want to be tied down to one design, as they feel that it is limiting and can grow stale. I hear ya! In my Share-worthy Design course (registration now open! ), I teach various ways to create a cohesive set of branded blog post templates, as well as the tools to diversify them a bit. If you scroll through my blog, you will notice that I don’t use one template, but rather a cohesive color palette, typography, and general look + feel. These attributes together account for a cohesive brand. Pinterest is such a robust platform, that I typically use it instead of Google as my search engine. As a visual person, I love the interface and how easy it is to locate the information I am seeking. Because Pinterest is a visually based platform, your images are crucial to getting noticed. Through creating high-quality branded blog posts, or images on your site, you are more likely to have them shared on Pinterest. You won’t want to miss out on this platform, as content lives SO much longer, and therefore is shared at a higher rate than any other social media platform. Through a well designed + consistent brand image, you will achieve instant recognition of your brand on Pinterest. I know when I scroll through Pinterest, I can quickly identify the blogs I follow, because they do an outstanding job at maintaining a unique, yet consistent, brand. This is key to building trust with your readers, as well as recognizability. It is proven that adding images to your content increases engagement. If you are like me, reading extensive text (especially data) can get exhaustive. Through illustrations, icons or graphs, your data can go from drab to engaging. You will be able to communicate your points much quicker through the use of infographics. Don’t let your content sit in the background, give it a boost through visual images. Once you have the tools to create your own compelling illustrations + icons, you can design visual images that reflect your brand. These unique images will help your brand stand out, as well as maintain consistency. Not to mention, infographics are one of the highest shared images on Pinterest, and on the web. People love a good infographic, as it easily compresses otherwise complex content! Instagram, not unlike Pinterest, relies on engaging visuals. Though photos are the most commonly shared images for personal accounts, businesses/blogs take it a step further to get the most out of this platform. Through sharing inspirational quotes, branded images, promotions, or illustrations, you can up your Instagram game, and diversify your posts. Check out examples of the above posts from various brands (and go ahead and give them a follow on IG!). You can see how through adding a bit of typographic + design love, they’ve created a story and purpose behind their visuals. At a quick glance, you understand what they are trying to communicate. Instagram is also another opportunity to increase recognition + trust with your audience. Your Instagram should be just as well branded as your business card, website, blog post images and all other branded collateral. Graphic design skills allow you the capability to brand your own images and provide a cohesive home for your Instagram. Email newsletters are a great way to connect with your readers, and build a relationship with them weekly through their inbox. Just like your blog posts, your newsletter should maintain consistent branded images, and a visual component that keeps them engaged. I cringe every time I see a newsletter without one bit of branding. I understand, some newsletter providers are limited in their image capabilities, however, I do think it is a missed opportunity as a brand touchpoint with your audience if you neglect your branding. There are several ways to incorporate images into your newsletter, however, the bare minimum should be a header image. Check out the examples above if you are craving even more visual inspiration! Yet again, beautifully branded images make all the difference in someone’s inbox and set you apart from others. There are endless possibilities to selling products online — t-shirts, mugs, planners, e-courses, e-books, digital downloads, stationery etc. With marketplaces such as Etsy and Gumroad, setting up a shop online couldn’t be easier. The tough part (and most exciting to me!) is designing the products for purchase. I’ll say it again, good design builds trust. If you neglect the design in your products, you are missing out on a HUGE potential. A quality designed product holds much more value than one where design was left on the back burner. Through the Share-worthy Design course, you will be able to take the knowledge you gain about building your personal brand, and apply it to your products. Attention to typography, color, illustration, pattern and photography will bring you leaps and bounds above your competition. The visual design is often the first impression your brand makes, so make sure you invest in it. If you provide products, e-books or worksheets in your brand, mockups are a must! Like infographics, they provide a visual representation of your product. They allow people to visualize what the end result is (download, ebook, etc), and be more compelled to hit “purchase” or “download.” There are a wealth of free + paid mockups available online, to simply drag & drop your PDF. I personally like to create them on my own, as it seems much faster + I know it will be branded to my business. In the workshop mentioned below, I will also be going over how to create your own mockups! (you can register at the bottom of this post). Just when I thought I was done with Powerpoints, I began offering online workshops and recognized the value in presentation slides. They help convey the information you are speaking about in a visual way, allowing the viewer an easier way to digest the information. I admit it, I can’t turn down a good webinar, so I find myself constantly signing up to pick up a new skill or process or learn something new. When the host presents their slides, I can’t help but either validate their brand, or cringe at the design. I realize I may be a bit biased (and snobby!) as a designer, however, I know the same reaction is universal across all industries. We treat brand design (even in the form of presentation slides) as a subconscious checkmark of validation. Is this brand professional, or elementary? Through attention to details, such as your presentation slides, you gain the opportunity to show off your brand and give yet another checkmark that your brand is trustworthy. Your brand design transitions to slides through the color choices, font pairings, and any visuals you provide. Make sure you give your slides enough breathing room, or white space, so that the content is legible and the design is non-invasive. I’m always a fan of a good worksheet or digital download! These PDFs are great for any business, whether you sell them, give them away as printables or use them internally for your brand. Checklists, recipes, calendars, workbooks, or brainstorming sheets are just a few printables you could incorporate for your business. These workbooks are also a great tool to use as a lead magnet or opt-in to your newsletter! Again, make sure your printables are well designed + branded. If you want people to use your worksheets, make every effort to design something beautiful that they can’t resist but to download and print out. My pal, Kelsey of Paper & Oats, and I are hosting a workshop this Saturday all about how to design your lead magnet PDF, from start to finish! If you are looking for a few ways to get started in design, or just get a peek at our processes, you can join us here! We will also be talking about that steal of a deal bundle of both of our courses we’ve been hinting at for weeks :). Hope to see you there!